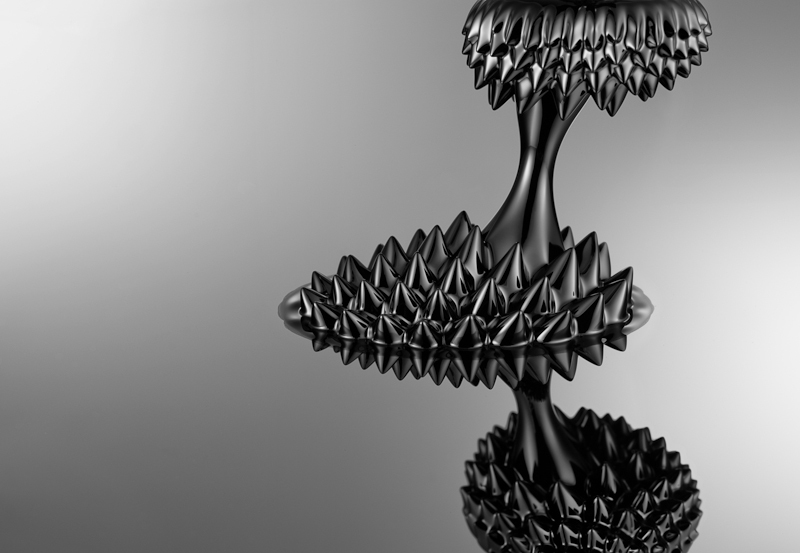 ferrofluids are colloidal liquids made of nanoscale ferromagnetic particles suspended in a carrier fluid. 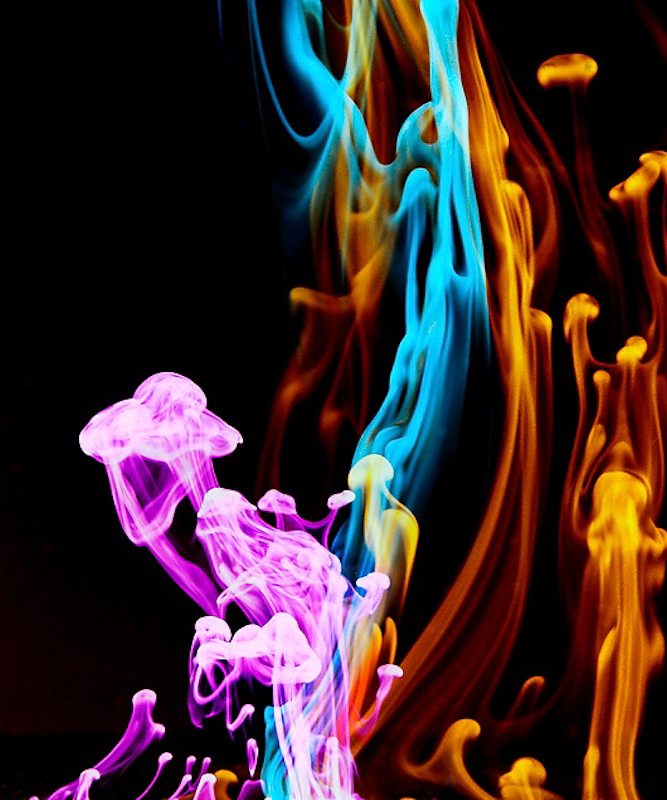 surfactants in the fluid prevent the agglomeration of the nanoparticles because their strong van der waals forces exceed the particles’ weak magnetic attraction. reducing the size of the magnetite (or hematite) nanoparticles to below 10 nm is key in preventing their precipitation from the carrier fluid. at such length scales, brownian motion ensures their indefinite suspension under normal conditions. 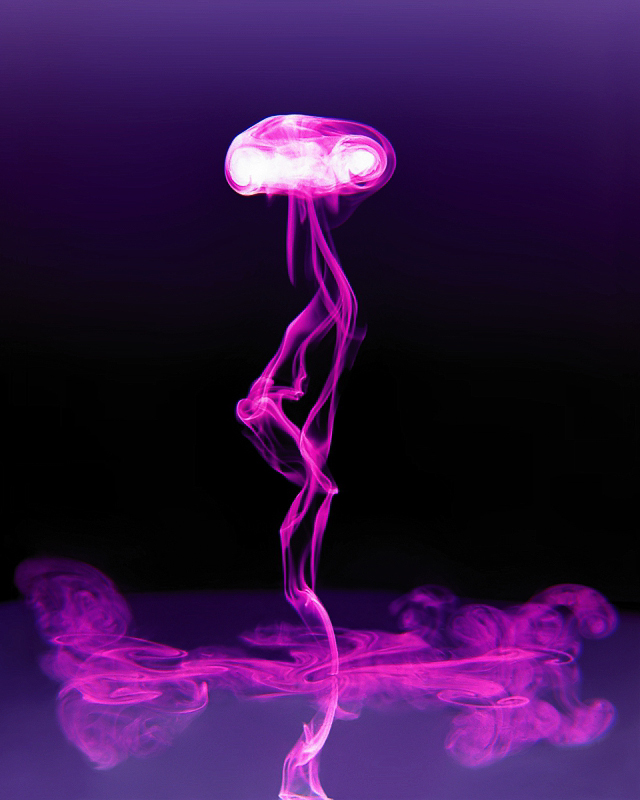 this photograph demonstrates the magnetic properties of this liquid as it shape shifts under the magnetic field setup by two carefully positioned rare-earth disc magnets. one magnet lies below a silicon wafer, while the other hangs from above. 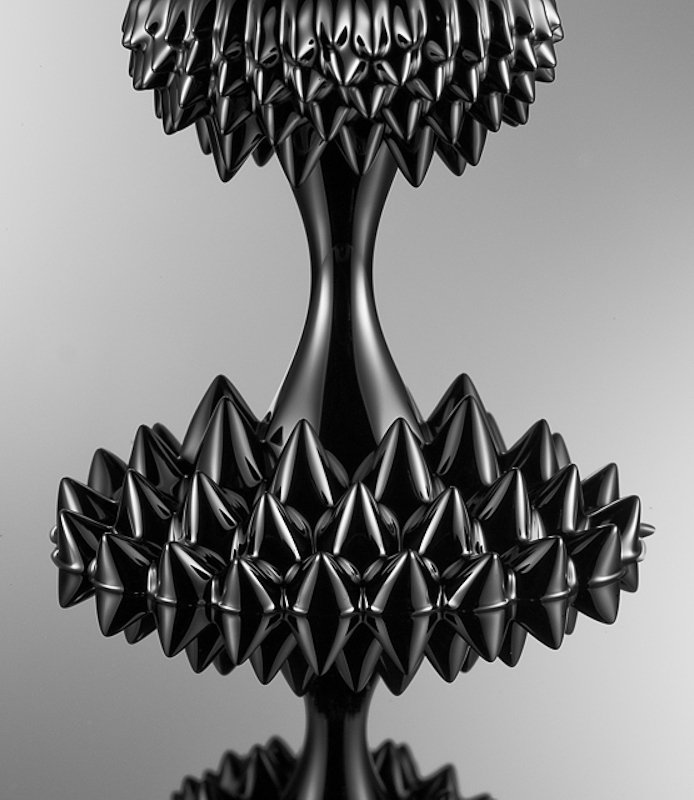 the protruding cones are a result of the compromise between the minimization of magnetic energy versus the minimization of surface free energy. tribute to the 1996 movie "trainspotting", directed by danny boyle based on the novel of the same name by irvine welsh. this is a pool of silicone oil in a dish that is glued onto a loudspeaker. the loudspeaker is sinusoidally vibrated at 15Hz with an peak-to-peak amplitude of roughly 3mm. 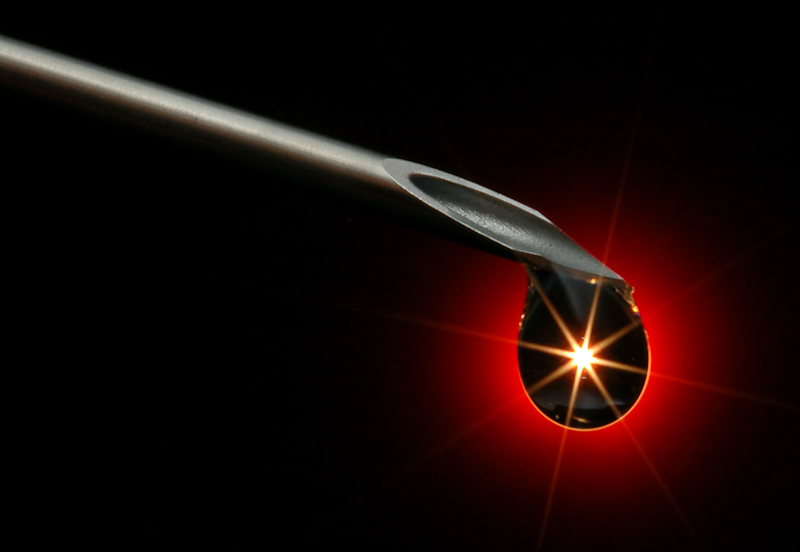 the syringe is used to dispense silicone oil droplets that bounce up and down above the surface, at 15Hz. 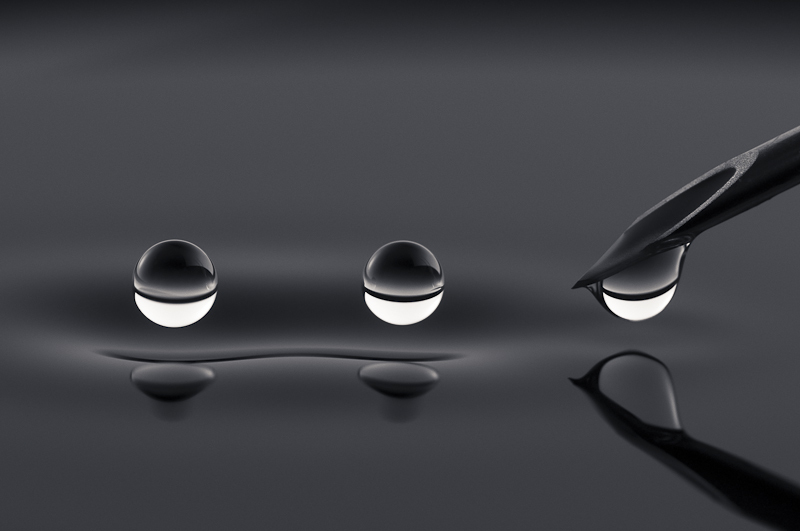 the wavelength of the perturbed surface, which is a function of the frequency and silicone oil depth, determines the optimal spacing between the bouncing droplets. interference between the droplet-induced waves locks the droplets into phase and keeps them at one wavelength apart. these droplets can bounce indefinitely, but game is over as soon as some impurity breaks the surface of the drop, which then disappears immediately. 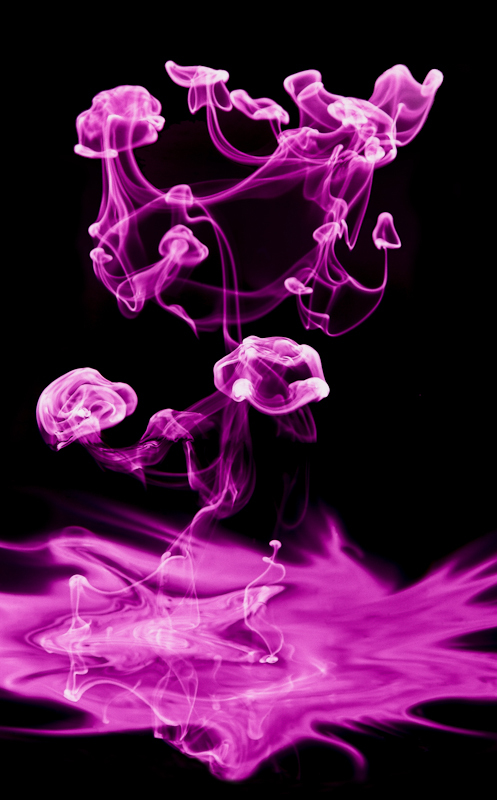 this photograph represents an experimental investigation of the theoretical work by john bush in the field of hydrodynamic quantum analogs. these silicone oil droplets are bouncing indefinitely above a vibrating pool of silicone oil at 15 Hz. the surface waves generated by the droplets are analogous to quantum mechanical waves that guide the dynamics of quantum particles. 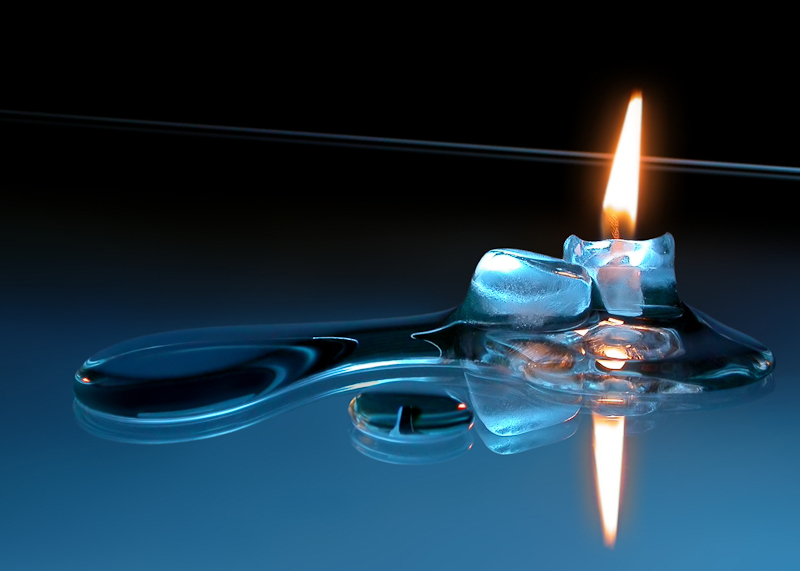 while the droplets *move* like quantum particles, they *behave* like quantum waves. 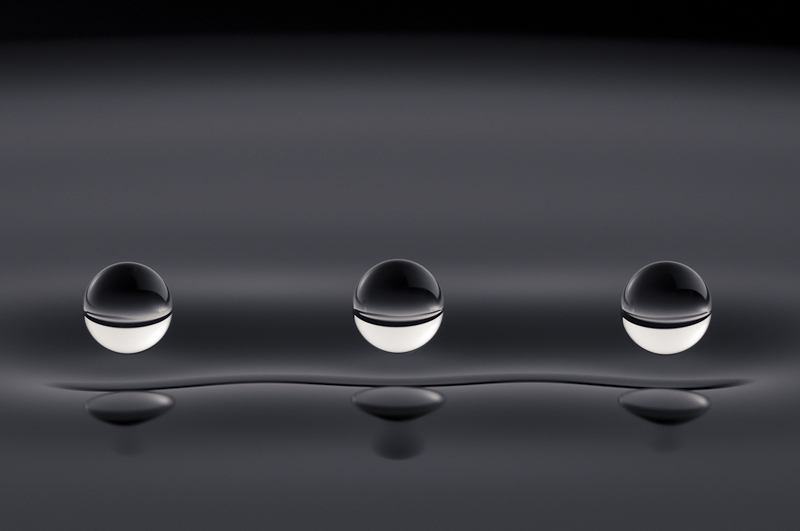 the droplets’ wave fields mediate their interactions with their surroundings, with each other, and even with themselves - similarly to electrons in the double-slit experiment. such bouncing droplets were discovered in 2005 by yves couder and mark the first real-world demonstration of the pilot-wave theory postulated by de broglie in 1927. this behaviour provides measurable and intuitive insight into the mystery of particle-wave duality. 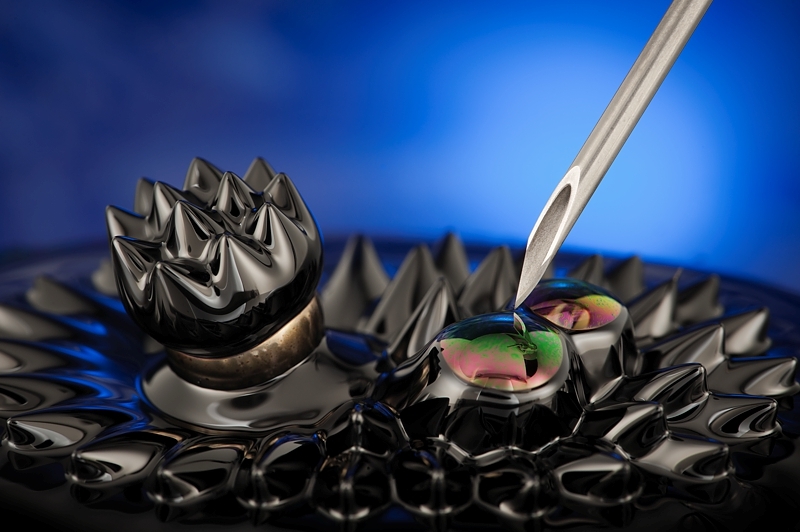 this photograph represents a snapshot of the dynamic response of a ferrofluid to an intricate magnetic field distribution over a silicon wafer. 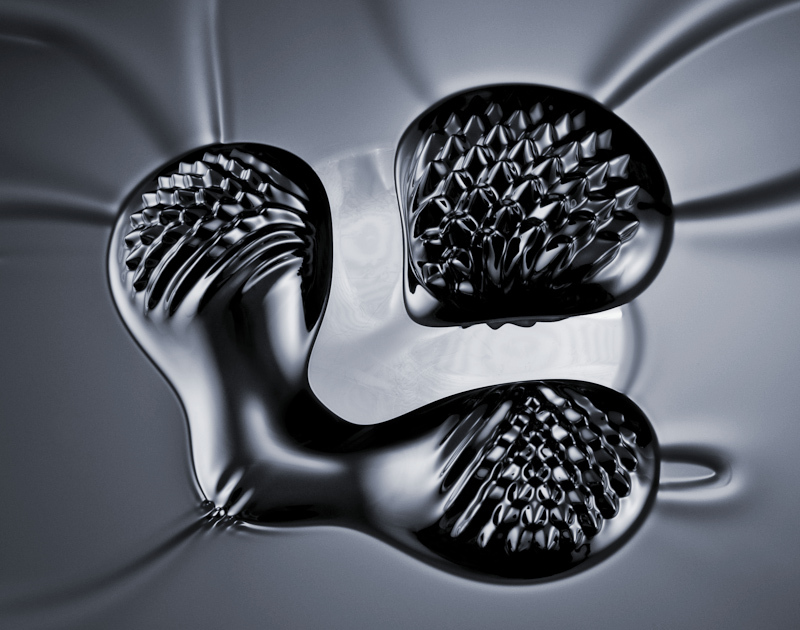 a ferrofluids contains magnetic nanoparticles that are suspended indefinitely in solution. 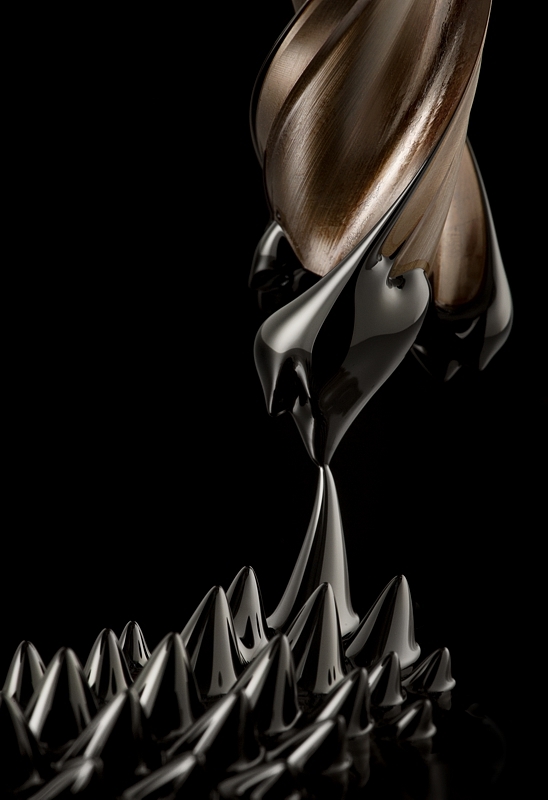 not only can magnetic fields shape and displace such a ferrofluid, they can also tune its viscoelastic properties that change its behaviour in a dynamic system, with important applications such as vehicle suspension. the magnetoviscous effects relate to chain formation of nanoparticles, and can be tuned by engineering the size distribution of the particles. the ability to engineer the nanorheological response of such systems has far reaching technological applications. 1/250; f/24; ISO200; 85mm; Nikon D700. magnetized 3/8" end mill approaches magnetized ferrofluid on a silicon wafer reflecting a velvet background. this photograph captures the instant when the two meet - a moment of metal love. 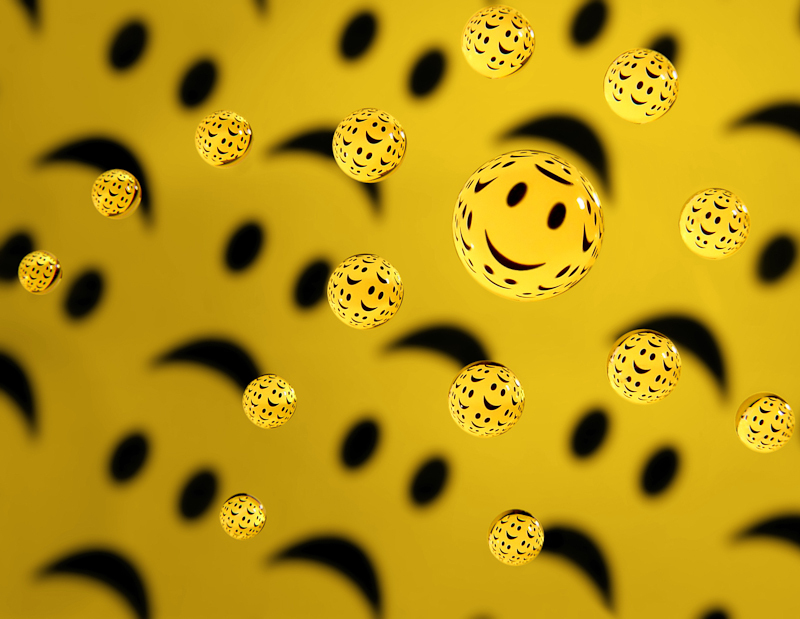 the water droplets act as converging lenses that inverts the out-of-focus sad faces into sharp happy faces.